Phnom Penh is the largest city in Cambodia and is also the capital city. This is the focal capital ever since the French laid claim over Cambodia. It has been developed to be the basis of well-known commercial, industrial, historical, tourist and cultural centres and has developed to become the centre for Cambodia’s direct economic system after the year 1979. Previously known as “Pearl of Asia”, Phnom Penh is regarded to be one of Indochina’s most beautiful of the French-constructed cities in the 1920s, together with Sihanoukville and Siem Riep. 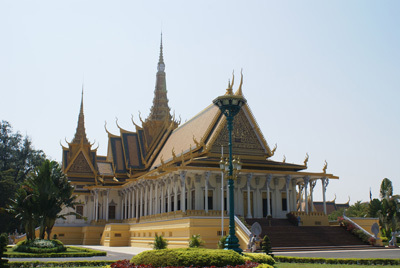 Phnom Penh is a noteworthy domestic and global tourist spot for Cambodia. On top of its conventional but contemporary additions enclosing the city, Phnom Penh has caught the attention of tourists from all over the world. Founded in the year 1434, Phnom Penh is still noted as a site of amazing cultural attractions and historical beauty. The amount of examples of existing French colonial architecture, like The Royal Palace, signifies the essence of classic and the modern social life as well. One of the most historical structures from the early days of Phnom Penh is called the Wat Phnom, which was built in the year 1373. The key tourist sites are: the Royal Palace with Silver Paghoda, which dates back to the mid 1880’s; the National Museum, which was built during the French colonial period in the late 1880’s in the classic style of Khmer and congregates a wide anthology of Khmer relics; the Independence Monument, though modern from the 1950’s, was also built in the old Khmer style. Most tourist came to Cambodia because of ANGKOR WAT not Phnom Penh.